The Guinness Book of Records is on the verge of getting a new set of the World Shortest Couple, when Katyucia Hoshino and Paulo Gabriel da Silva Barros, have finally decided to take their lovely relationship that have spanned eight years, to the next level by getting engaged. Daily Mail reports that the couple who are from Brazil, measure a combined five feet and eight inches, with Hoshino who is 27, at 35.2 inches while the 30-year-old Barros, measure at 34.8 inches. The lovers were brought together after some people identified them separately on social media and they have enjoyed their affair since then. couple, a record currently held by another Brazilian couple, Douglas Maistre Breger da Silva and Claudia Pereira Rocha, who both measure at 35 inches and 36 inches respectively, and have been married for 18 years ago. 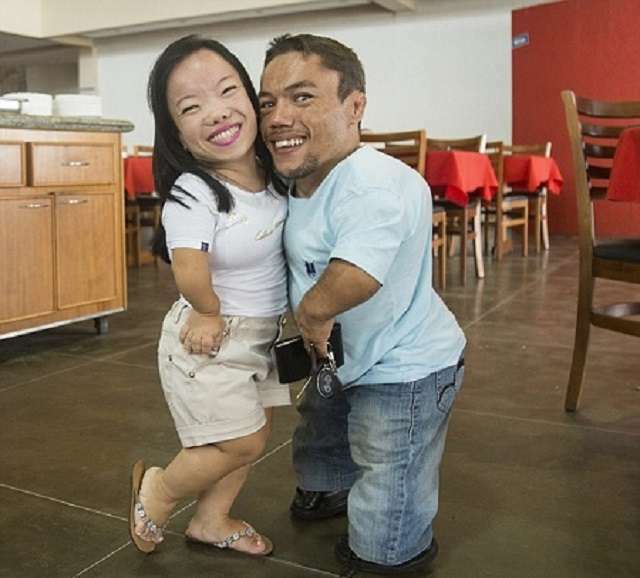 Hoshino suffers from achondroplasia dwarfism, a condition that affects bone growth, though that has not stopped her from being romantic.